Often the advice given to workers is, “Save as much as you can,” but that is not clear enough. How should it be saved? How much can you really defer? 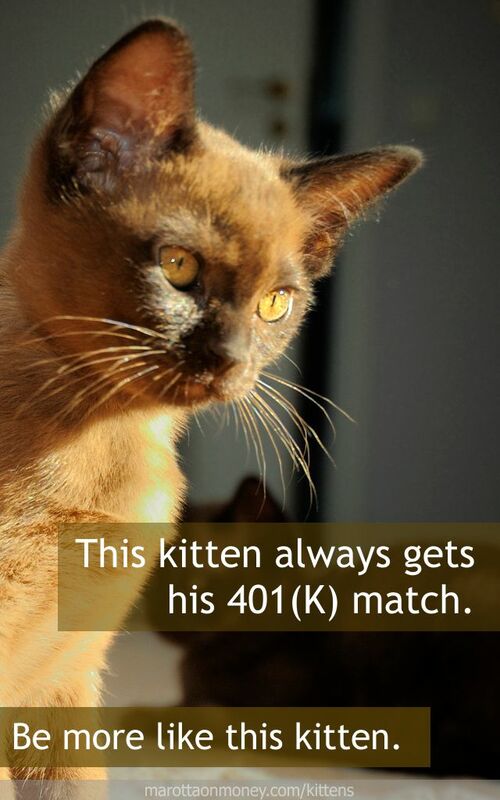 When it comes to retirement savings, this kitten has one clear option he always takes. He has a 401(k) retirement plan through his employer that, like most 401(k) plans, has an employer match. For him, if he puts 5% of his salary into the 401(k) then his employer will add an additional 4% into the account. This employer 401(k) match is like free money for the kitten. When he saves a minimum of 5% into his 401(k), he gets an 80% return on his money from his employer just like that. Furthermore, this kitten has automated his 401(k) savings with his company’s payroll manager. Automatically from his paycheck, 5% is pulled out and given to his 401(k) to guarantee that he will receive his match. That means that every month, regardless of whether the kitten remembers, he is getting an 80% return on 5% of his salary. Now that’s smart saving!